A 30-year-old cystic fibrosis sufferer from Leeds has discovered she will be considered for a life-saving double lung transplant but must wait until her health deteriorates before her name is placed on the waiting list. Jessica Spoor, of Chapel Allerton, has been told she is suitable for the transplant she said will give her a second chance at life. But Jessica, who struggles for breath and has to have regular oxygen therapy, is currently deemed too well to go on the waiting list for the transplant at Newcastle's Freeman Hospital. Jessica said her lung function is currently stable at 34 per cent and she does not believe she will be considered for the waiting list until it is consistently below 30 per cent. 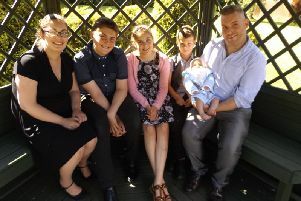 Jessica, who was born with the genetic lung disease, enjoyed a full and active life until last March when she started suffering from repeated chest infections which meant she had to make the tough decision to leave her job in human resources at Asda in Morley. Jessica Spoor (centre) presenting a cheque for 12,000 to ward J6 at St James's Hospital in Leeds. She was a keen runner and gym goer until her health deteriorated. She ran the Great North Run half marathon in 2009 with her younger brother Jack. Jessica said: "They have said I'm a perfect candidate so it is just a question of when.
" I was happy because obviously that is going to be my last resort at the end of the day so I was glad to hear that I am a good candidate for a transplant. "They have also revealed that my lung function is a little too high to go on the list." Jessica added: "It is frustrating in one way, but the good thing is I am being closely monitored. "If my condition does worsen it looks like I will make it on to the list quite quickly." A fundraiser including an auction and raffle on Jessica's 30th birthday in January at Banyan in Leeds city centre raised £4,900 towards a total of £12,000 raised for in her name for St James's Hospital ward J6, where cystic fibrosis patients are treated. 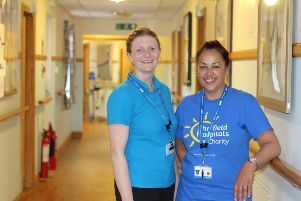 Jessica said: "I have discussed it with the patients and staff on the ward and the money will be put towards decorating the rooms to make them more homely for the patients. "With them being stuck in there so much it will make such a big difference to them. "It is like our second home on the ward so anything that can be done to improve it will help." After graduating in 2008, she travelled with friends for six months and visited Nepal, Thailand, New Zealand, Fiji and America. She started working as a waitress for Arc Inspirations, which runs bars and restaurants in Leeds and Harrogate including Banyan. After five years Jessica was promoted to general manager of Trio Bar in Headingley. But she had to leave that job in 2016 for health reasons and move to an office job at Asda, which she had to leave earlier this year because she was too unwell to continue.